Kate Middleton has put her foot down and told Prince William to sober up after the Duke of Cambridge turned to booze in dismay and heartbreak. What could make such a fine fellow as Prince William crumble and seek solace in the bottle? Well it seems that William’s dear father, Prince Charles, and his wicked step-mother, the scheming Camilla Parker-Bowles, have beguiled Queen Elizabeth II into giving the throne to Charles! Prince William along with most of Britain hoped that the Queen would bestow the throne upon him and his most popular wife, Kate Middleton. Charles and Camilla are sullied by scandal and do not deserve to ever inherit the monarchy. And let’s not forget Camilla’s growing mental illness exposed by GLOBE recently. Just what Britain needs, a mad queen! 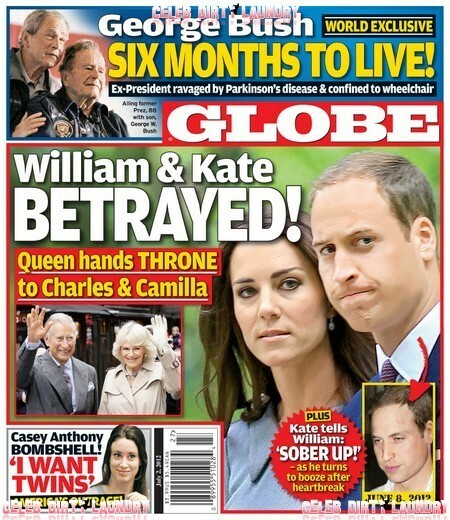 We will get to read all the details of Charles and Camilla’s betrayal when we get the print edition of GLOBE. But there is more! GLOBE also promises to reveal the details on murder mom Casey Anthony’s bombshell – the sicko says ‘I Want Twins.’ If ever there was an argument for sterilization… There is also some sad news on the GLOBE cover – former President George Bush is confined to a wheelchair and has just six months to live as he is ravaged by Parkinson’s disease. We wish him the best of luck. Once again GLOBE does it right! GLOBE brings us fascinating reading on the hottest issues. Each week I read it cover to cover and each week I am entertained while I learn. You just can’t beat that!